the season. The highest goal scorer was Sophie O’Callaghan. For some of the Year 13 girls, enjoying playing competitive hockey was a fitting end to their Hymers hockey career and we thank them all for their loyalty and commitment. For others in Year 11 and 12, this season of playing Second team has helped them gain a greater depth and understanding of playing at this level. Some of these girls have now set their sights on playing First Team next season and continue to train hard to realise this dream. The girls enjoyed playing hockey this year, but due to weather and lack of opposition numbers were restricted to only 3 games. Their performances against St Peter’s Thirds and Ashville Seconds were excellent, with the former resulting in an excellent draw. team and it was played as all local derbies should be: fast paced and end to end. Alex Casselden came close on a number of occasions to scoring, after taking on and beating many of the Pocklington side. 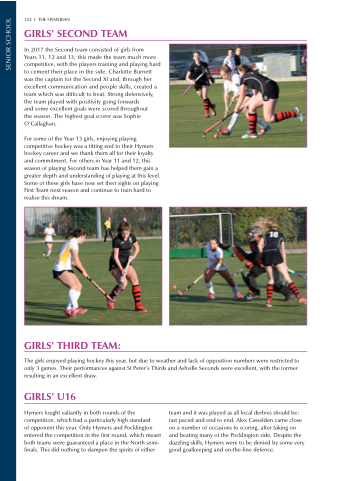 Despite the dazzling skills, Hymers were to be denied by some very good goalkeeping and on-the-line defence.